The world lost a legend last week. And whether you liked his particular genre of music or not, there’s no doubt that David Robert Jones, aka David Bowie, relentlessly extended the boundaries of his craft and was a true innovator. He was masterful at taking seemingly disparate ideas from many sources and synthesizing them into a unique art form. I have known his work for years but was not aware until his death that one of his quotes captures the essence of what I have worked hard to convey to clients throughout my career. 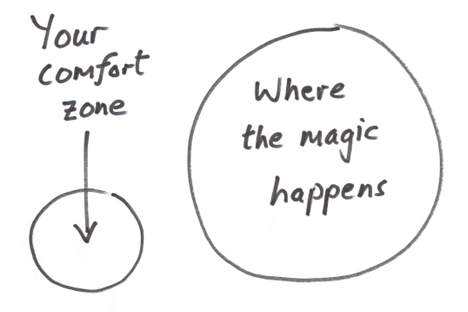 We’ve been told the importance of getting out of our comfort zones. That’s where true change occurs. That’s where “something exciting” happens. Yet, so many of us stay in familiar places and expect drastic changes. The struggles begin when we endeavor to commit such a fundamental concept to practice. One of the reasons is that we cannot see how far beyond the boundaries of our comfort zone that we dare stray. An inordinate fear of risk can overwhelm and keep us in the same rut as yesterday. What is an acceptable balance between comfort and risk? While I understand the message it is intended to convey, I struggle with this image. My issue is that, while it “feels good,” it does not address the fundamental problem of balancing comfort and risk. How can one move from the comfort zone and not stray into an area of risk that cannot be controlled? The message becomes mixed. Magic happens “out there” but how do I get there in practice? Where we should live, I believe, is right outside the boundary of our comfort zone, pulling and pushing it ever so further outward and expanding it in the process. That’s “just about the right place” to effect change, to do exciting things, without undue, uncontrolled risk. And as this happens, we will find that we are going progressively further and further “out of our depth”, expanding boundaries and achieving greatness.